The way we measure the outcomes of social good programs must be about more than the numbers. This sewing class provides these women with so many intangible benefits that are impossible to measure. How do we measure the value of making a friend for these women? There have never been more initiatives in the social sector than there are today, which is so exciting for the future of humanity. As my friend Afdhel Aziz says, “Good is the New Cool.” So it’s no surprise there are more people, corporations and entrepreneurs seated at the social sector table. This is a good thing, but comes with one big danger. We (the social good sector) are in the business of changing people’s lives, not making widgets. We can’t possibly measure the work we do in the same frameworks that corporations measure their work. But more and more, we are seeing this happen. We are forcing small NGOs (non-government organizations) and CBOs (community-based organizations) to qualify outcomes on the terms of their corporate sponsors. The problem with this is that the more we cater the work, the measurements, and the outcomes to these corporate terms, the more we put ourselves at risk of deviating from our missions and from the programs we know work. Changing people’s lives can’t be measured the same way we measure making widgets. The many and wildly important intangible benefits of our programs can get lost, or worse yet, we are forced to design the projects to diminish these intangible outcomes. I joined the social sector about five years ago, after a successful 15-year career in advertising and branding, to run a modest public non-profit focused on empowering women and children through health and livelihood both in India and in the United States. As I was navigating a new industry, I dove in deep to learn as much as I could. And surprisingly, I found my lack of experience was what allowed me to see this dangerous pattern in the industry, as my mind was unburdened with the traditional non-profit ways of thinking. It was a pattern I noticed not only in my own work, but also in the work of many NGOs around me. For Example, several years ago we were expanding what we believed to be a successful vocational sewing program in a rural village in India. It cost our organization $1,000 to send forty women to a three-month sewing program. At the end of the term, the program had pre-negotiated a position at a local factory, which over the course of a year would result in upwards of $10,000 in the pockets of the 30 women who chose to take the job. This outcome couldn’t have been better for us. We felt we were checking all the boxes of economic empowerment, women’s empowerment, and skill building. However, when we expanded to a culturally identical village, literally zero women accepted the jobs. This was a huge disappointment. Perhaps the program wasn’t as good as we thought? Instead of shutting the program down right away, we spoke to the women who took the course, but not the jobs. And discovered something that I think we all knew intuitively, that there was more value to the program beyond the rupees in their pocket. However, our corporate training and our NGO training had led us down the wrong path. We were measuring the wrong outcome. Every woman who took the course got something of value. For some, they simply wanted to improve their sewing skills. It was something they did all the time, and it helped them save money. For others, they wanted an excuse to get out of their home and escape from their in-laws for a while. Some wanted time with their friends, some wanted to make friends. So even though these women weren’t walking out of the course with more rupees in their pocket, they were all leaving with an elevated sense of dignity. When we position dignity as a human right, we understand its importance. We understand that the work we do in the social sector isn’t just about the number of wells we build, but about the lives that change with access to those wells. The work isn’t just about the number of kids that attended school, but about how those children’s lives changed, if their minds were opened, if their parents benefited, etc. 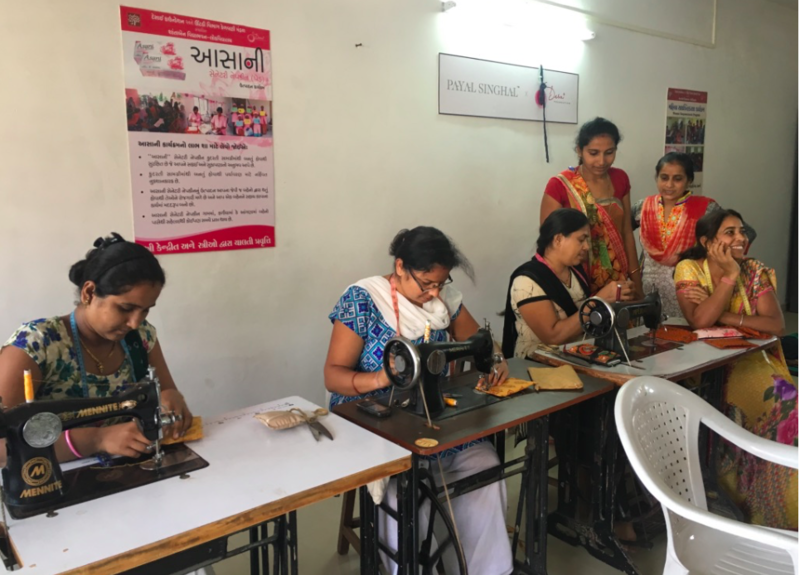 It’s not just about the money that a woman now earns after a sewing class, but about the transformation she has had with her new friend, her new confidence, and her new skill. And that she goes on to impact the lives of her daughter, her sister, and beyond. In fact, some social good organizations are actually built in ways that damage dignity – the metrics-focused one-for-one model of just giving away meals, shoes, etc can actually reduce the dignity of recipients. Handouts, except in cases of extreme poverty, are not the best way to develop sustainable models for change – because handouts don’t build self-reliance or dignity. “In the traditional food aid model, needy recipients are simply ‘takers’ and are subject to whatever canned food or bagged commodities the ‘givers’ had around to give. This goes squarely against newer food banking systems of a shopping experience with options of fresh food mixed in with canned items to users can have the dignity of choice.” Says Ellen Gustafson, Co-Founder of FEED, and Co-Director at Summit Institute. Why are we evaluating our work in dollars, cents, and widgets, and not thinking about the actual impact we are having on the lives of those we serve? Why are we catering to corporate metrics when we should be asking them to speak our language? They insist on “maximum output” for the dollar rather than thinking about the many and important intangible benefits of the work the social sector does. And most importantly, if we reduce our work to these metrics, are we losing sight of what we were doing in the first place? I don’t mind learning from the business world, but my concern is that the more we start to sound like a corporation, the more we start to behave like one: profit at all costs, numbers before impact. There are many benefits to the ‘businessification” of the social sector. We are more rigorous and efficient in our spending, our talent pool has grown, and impact marketing has transformed the way people think about what is possible. In no way to do I want to discourage corporations or entrepreneurs from entering the space – in fact – it’s just the opposite. Corporate partners play an essential role in moving our world forward. But, we need to think really carefully about how we grow and measure our work. Even a venture capitalist like Chamath Palihapitiya sees that there is a difference between measuring a company and the prosperity achieved. His firm, Social Capital, also acknowledges that basing a company’s success off of quantitative metrics alone is not enough to determine a company’s potential to reach more impactful goals like global peace and elevated dignity. I am quite clear that many things need to be outlined quantitatively. I am also not naïve to think that we are going to start moving backwards and suddenly not use quantitate values to measure our work. But, the work we do has to be more than just “we provide x number of widgets, to y number of people, for z investment”. There has to be more to what we do than the numbers. There has to be more than the number of wells built, than the number of shoes distributed, than the number of schools built. We have to remember the actual people that we are serving on the ground. The Desai Foundation is guilty of this to some degree. We talk about 340,000 lives impacted, and we cite many such numbers in our annual report. But what I do appreciate is that we take the time to ask questions and speak to those we serve. We focus more on stories of individuals than the numbers. And for keeping a sewing program open despite the numbers, because we understand the impact that one woman’s dignity has on her daughter, her mother in law, and on her whole community. When the social sector designs programs void of dignity, or hoping that dignity will be a happy by-product, we run the risk of creating a cycle that traps people in poverty. There must be intentionality to cultivating dignity in the programs we develop, implement, and in how we measure them. If we continue to allow the corporate world to dictate the terms of how we measure our work, we may do so at the expense of dignity, and the many other intangible benefits of our programs. Darren Walker, CEO of the Ford Foundation, acknowledged the error of major funding organizations, like Ford Foundation, earlier this year. Outlining their emphasis on shorter-term grants, and misguided metrics. How do we collect data on the way the women felt after the sewing class, and avoid reducing them to the dollars and cents in their pocket? I’ve often explored the idea of a dignity quotient. What would that look like? What factors would it include? If we challenge companies to have a dignity quotient – and instead of measuring the dollars they donated and the number of lives impacted, but rather the dignity their company helped to cultivate – that could be a pretty powerful shift in the way that corporations are really participating in the social sector. I don’t yet have the tools or experience to take this on, but it’s a problem I hope the industry can solve. Until then I will be leaving many metrics in grants blank, and telling stories about the people we serve, hoping that grantors can see beyond the numbers. When it comes to the social sector, let’s shift the focus to the power of cultivating dignity, over the distribution of widgets and dollars. Because nobody, not even the poor, the hungry, the disabled, etc. want to think of themselves as just a number.